The geographical shape of Kosovo colored in gold is situated in the center of the blue back grounded flag where it has six white colored stars prevailed above each representing the different communities/ethnic groups of Kosovo being arrayed in a slight arc. 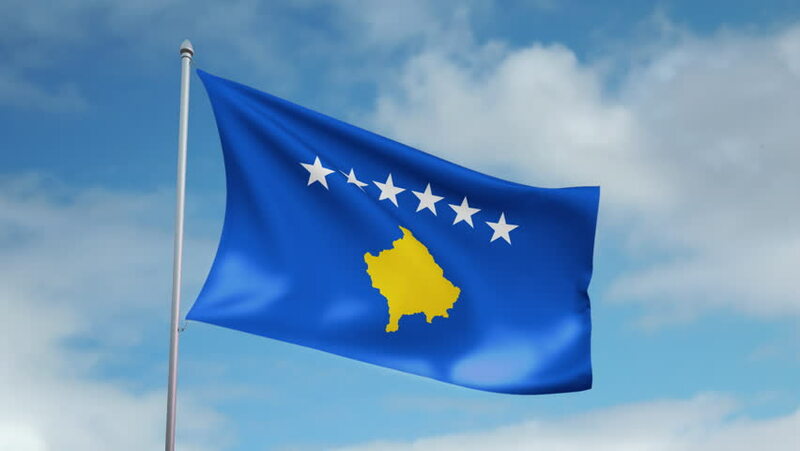 The flag was adopted by the Assembly of Kosovo instantly following the declaration of independence of the Republic of Kosovo from Serbia on 17 February 2008. The flag was designed by Muhamet Ibrahimi. Europe is the national anthem of the Republic of Kosovo and it was composed by Mendi Mengjiqi and has no lyrics. This particular anthem was selected for the reason that it contained no references to any specific ethnic group. It was elected by the Assembly of Kosovo and adopted on 11 June 2008. Note: The Flag Anthem or National Anthem of Albania is still very widely unofficially used in Kosovo along with other Albanian national symbols. Click here to download the anthem of Kosovo.